oh i just bought that UO fringe bag too!!! i love it! i wear it with everything! hello 🙂 i tagged you on my blog! I love fringes on bags. Its such a fun look. You look great in those jeans as well. Great outfit! I love your shoes!! The new blog of two fashionistas French, Olivia & Mariam, the next designer of this generation 😉 hii come on ! WOW! 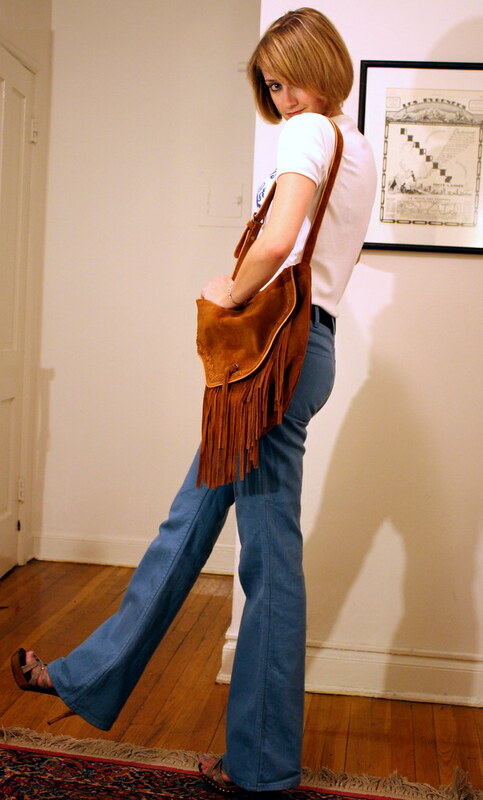 This fringe bag… I have similar fringe turquise bag from Cola Haan and I adore that…timeless hippie accessory! Enjoy it. Ur combo is simply, but chic! The fringe bag is divine!!! God purchase! This bag is gorgeous! darling what a gorge outfit! loving those jeans and the bag is delish! perfect look on you! love the bag! Love the fringed bag! Such a cute outfit, keep on keepin’ on girly! LOVING that bag. Fabulous find! PS. I gave you an award! love everything, the bag is gorgeous, love the shoes the jeans..great outfit!! I love that song! And the purse is fabulous! forget the bag, i want those jeans!